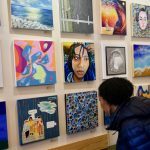 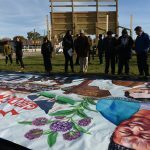 Gabriela Riveros, a Milwaukee-based illustrator, has created an art installation along the Kinnickinnic River in Pulaski Park. 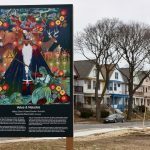 A mural depicting the history and resilience of the historic Garden Homes neighborhood was unveiled at a recent ceremony at the corner of Atkinson and Teutonia avenues. 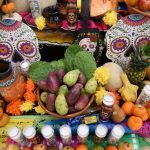 Between now and Nov. 17, the Walker’s Point Center for the Arts will be featuring the 26th annual Día de los Muertos exhibition. 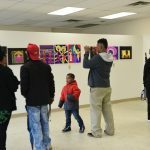 Sponsored by Near West Side Partners and BID #10, The 2018 Spirit of Wakanda Festival included music, dance performances and local black art for sale. 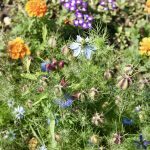 As August begins, Alice’s Garden in Lindsay Heights is bursting with abundant flowers, produce and herbs. 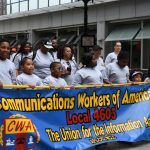 Starting in downtown Milwaukee, marchers in the Labor Day parade demonstrated pride in their unions as they made their way to the Summerfest grounds, where they were greeted with free entertainment. 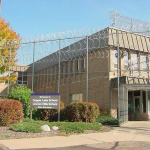 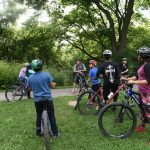 City youth who are interested in mountain biking are invited to check out the Milwaukee Mountain Biking Team, which meets twice a week at Riverside University High School. 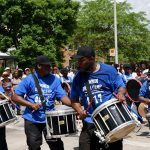 Milwaukeeans celebrated Juneteenth Day Monday, honoring the day the last slaves were freed after the Civil War. 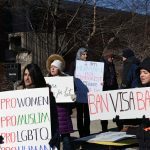 University of Wisconsin–Milwaukee students, faculty and staff gathered Thursday at the Spaights Plaza to protest an executive order signed by President Donald Trump that indefinitely bans Syrian refugees from entering the country, suspends entry of all refugees for 120 days and bans anyone traveling from Iraq, Syria, Sudan, Iran, Somalia, Libya and Yemen from entry for 90 days.